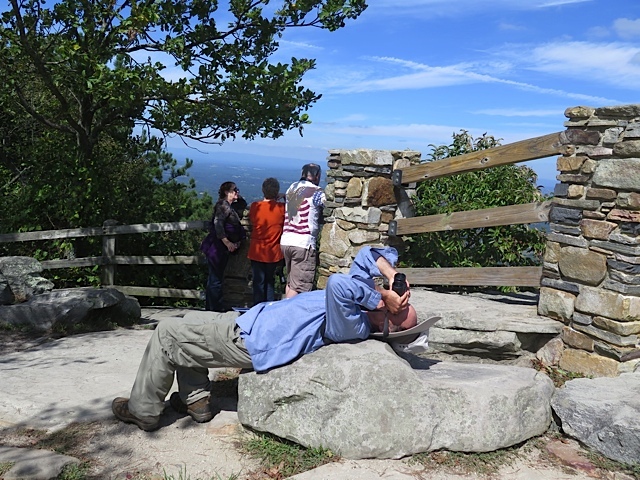 The Pilot Mountain Hawk Watch saw another great year in 2014. We tallied 5909 migrating raptors, including 5756 Broad-winged Hawks. Although these totals were about 300 birds less than we recorded in 2013, it was the fourth highest level since the 1991 beginning of the current hawkcount.org database. September 22 can be a very good day to be at Pilot Mountain State Park. In 1993, observers counted a record 10,835 Broad-winged Hawks on that date. In 2013, 3600 birds represented the second daily total. The 22nd also was good this year with more than 1300 broad-wings. However, Saturday the 25th was even better. That day dawned bright and sunny. It was busy at Little Pinnacle early in the morning. 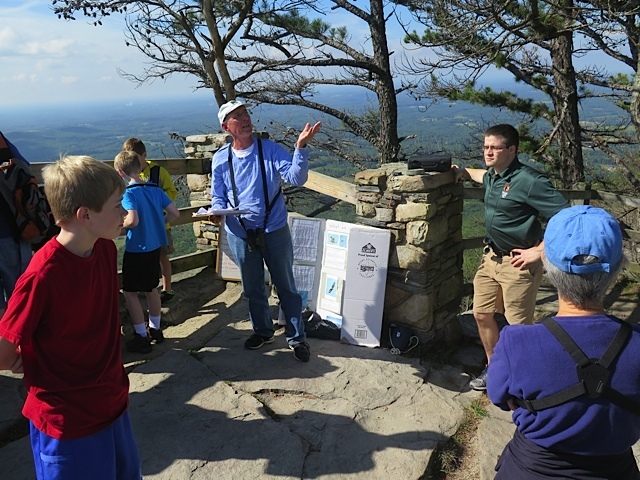 A scout group was there to learn about hawk migration and work on a merit badge. It also was Mayberry Days, so Phil Dickinson, Scott DePue and Park Ranger Jesse Anderson spent much time sharing the watch with inquisitive visitors. “Do you really see eagles, here?” Yes, we do. So far as the birds were concerned, though, things were pretty slow until mid-afternoon. Then, several large kettles arrived between 3 and 5 p.m. One group of about 250 birds moved directly overhead. However, the largest one nearly got by us. Only the sharp eyes of Howard Coston and Scott noticed a lot of specks way out on the southwest horizon barely within view with binoculars. Training a spotting scope on them, we discovered twin kettles of at least 500 birds each moving over Yadkin County. For the day, we ended up with 2392 broad-wings. This was the third highest daily count since 1991. It also was a good year for Northern Harriers and Peregrine Falcons. These species migrate only in ones or twos, not in large groups. This year, we saw 11 harriers and 9 of the falcons. Even veteran hawk watchers are thrilled to see these powerful flyers. Numbers of Ospreys and Bald Eagles were down a bit from 2013, but still respectable at about 30 each. We counted only one Merlin, though. 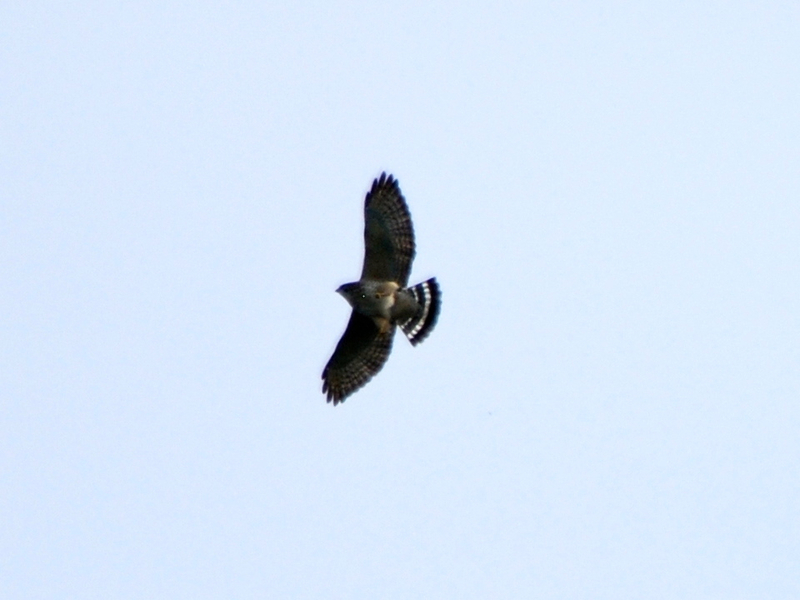 Other raptor migrants included Sharp-shinned, Cooper’s, Red-shouldered and Red-tailed Hawks, and American Kestrels. 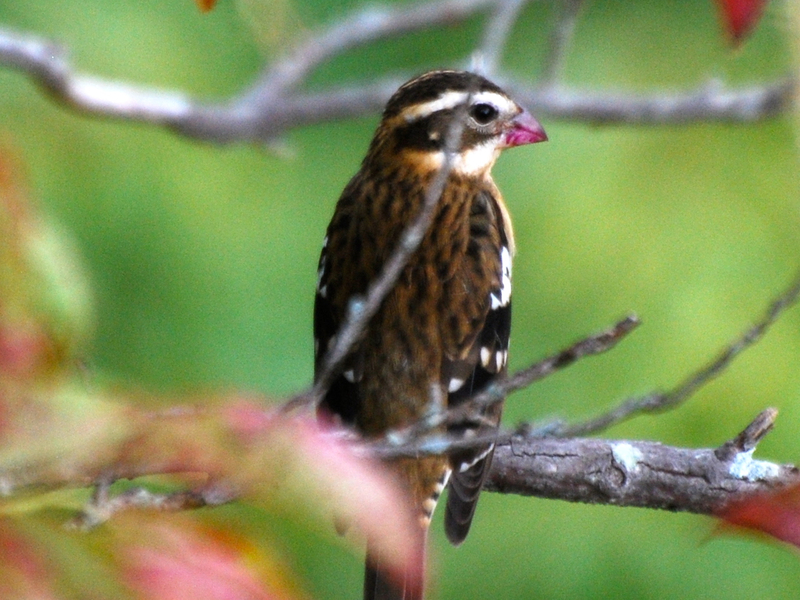 Raptors aren’t the only migrants to show up at Little Pinnacle in September. Take a leisurely walk up to the overlook from the parking lot on a sunny morning, and you are likely to see several species of warbler, including Pine, Black-throated Blue, Black-throated Green, Cape May and Black-and-white. One day, there was a Nashville Warbler, too. Scarlet Tanagers and Rose-breasted Grosbeaks also are frequent visitors, and this year a few Cedar Waxwings stayed with us most of the month. We also saw Veery, Wood Thrush and Gray-cheeked Thrush, and a Red-breasted Nuthatch was a good omen for the local winter birding season. We probably cannot define a trend based only on two years, but certainly 2013 and 2014 suggest that eastern raptor populations are doing well – especially the Broad-winged Hawk. Recent numbers far exceed what was counted through most of the past 20 years. Are there more birds? Or is it just more observers, better local weather or just the luck of location? What will 2015 tell us? Thanks to all of you who took part this year, including members of Forsyth Audubon and Piedmont Bird Club. It was a great mix of new participants and seasoned veterans. Photos by Phil Dickinson and Lon Murdick.